If He cares for the birds…. 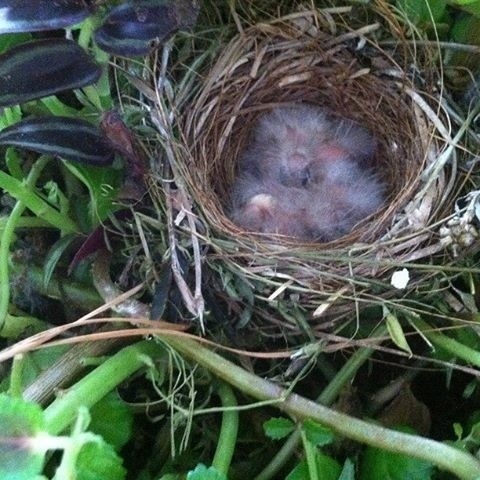 The girls found this nest tucked away in one of their Mimi’s hanging plants on her porch. We’ve been watching them daily and in awe at how the mama bird cares for these wee ones. When I look at the perfectly crafted nest and watch the mama bird go find food for her babies, coming back to the nest over and over… I can’t help but think of our amazingly detailed creator- God. He promises to tenderly provide and care for us. He doesn’t demand that we rise up and take things in our own hands but rather – like the helpless little birds who could be taken from their nest in a second, or destroyed by a watching enemy, He cares for them. And how much more does He love, value and promise to care for us? Oh, for faith to believe! what a special gift for you all to peer into the lives of birds! they look so soft:) thankful for a Father who cares like that.